A Yellow-bellied Sapsucker clings to a tree during a cold snap in Danbury, Conn., Feb. 2016. 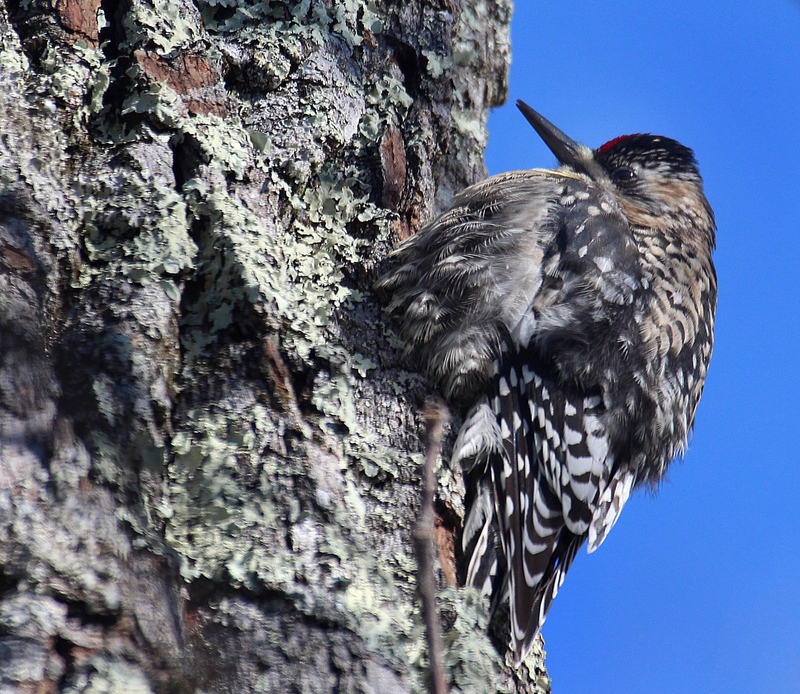 Yes, the Yellow-bellied Sapsucker is a real bird. 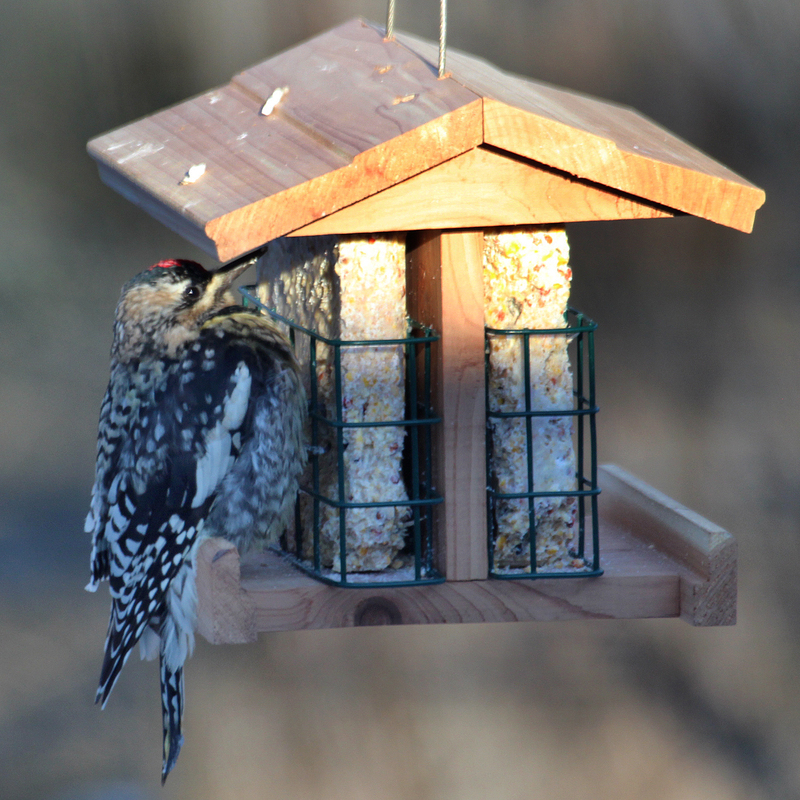 And I had one on my suet feeder this weekend during the cold snap in New England. It was the first time I had ever had a sapsucker on a feeder of mine in about 20 years of birdfeeding. 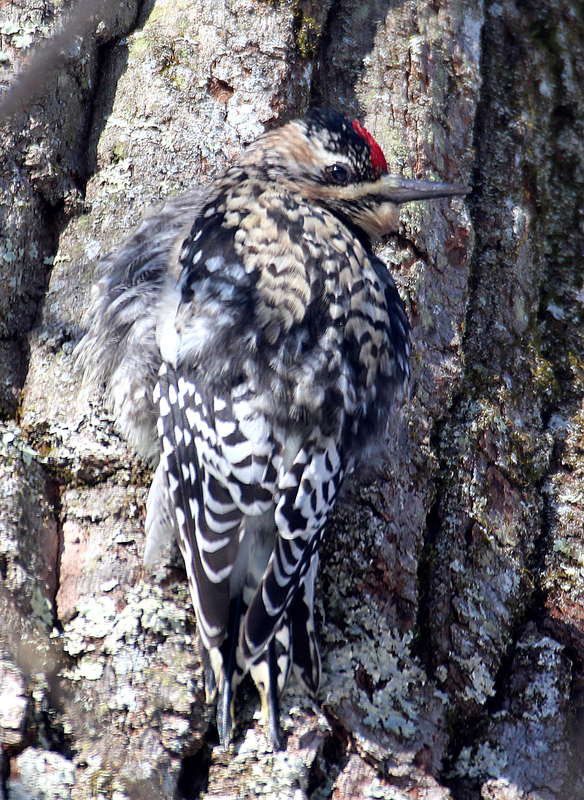 Plenty of other woodpeckers, but never a sapsucker before. I have, however, seen plenty of them in the woods among my wanderings, but never on a feeder before. Here are a few more photos of my visitor, none of which are great, but all serviceable. Notice how the bird is more streaked than our common Downy Woodpecker and how much more it blends in with the tree. A Yellow-bellied Sapsucker visits a suet feeder during a cold snap in Danbury, Conn., Feb. 2016. This entry was posted in backyard birding, bird feeding, Birds in snow, Winter in New England and tagged cold weather birds in New England, Yellow-bellied Sapsucker at feeder by Chris Bosak. Bookmark the permalink. Hi Chris — That sapsucker is downright coy. Not a glimpse of his yellow belly. Is that sapsucker puffed out because of the cold, or is it just normally a bit rotund about the breast? Thanks for writing! Most of it is because of the cold. They normally aren’t that puffy.